Messenger photo by Britt Kudla Gabby Estlund of Fort Dodge was an all-CIML Iowa Conference performer a year ago. New Fort Dodge cross country coach Joe Jackson will do his best to make sure the Dodgers compete at a high level relative to their potential in the days, weeks and months to come. More importantly, though, Jackson is focusing on building what he calls a ”community of runners and a family atmosphere” within the program, where the work done away from the course will lead to bigger and better results down the road. ”It has to start with involvement and investment — having fun and encouraging each other, but also working hard and putting in the time,” said Jackson, the father of former Dodger and Iowa Central standout runners Tara and Alex Jackson. ”In addition, we’re incorporating more service and volunteer projects to thank the great people of Fort Dodge who support our students in a multitude of ways. Jackson is replacing Tim Hanson, who spent 13 seasons at the helm. Six letterwinners return on the girls’ side, including all-CIML honoree Gabby Estlund, while the boys’ squad builds around two familiar varsity faces. ”Our emphasis will be on getting better as a team and individually every single day,” Jackson said. ”The focus is on being at our best at the end of the season. We’re learning now how to pack run, pull each other along, pace ourselves and finish up strong. Estlund is already a three-year staple for the Dodger girls. 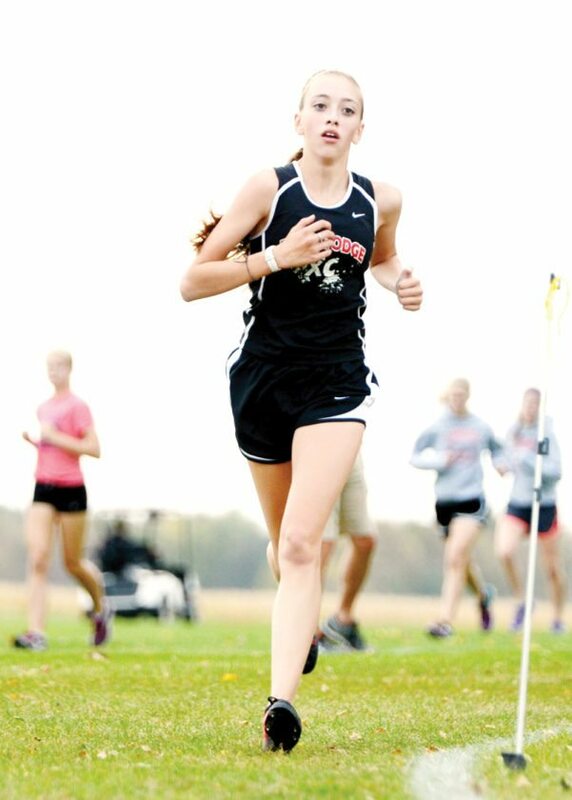 She placed 16th in the CIML Iowa Conference meet last season. Fellow senior Olivia Mitchell and juniors Shayla Reed, Brylea Grady, Kayla Smith and Christyn Nichols also offer experience. The initial lineup on Tuesday at Webster City will include Estlund, Mitchell, Smith, and freshmen Isabel Gruver, Alexis Read, Piera McBride, and Adyson Bork. Of the 17 girls on the roster, nine are ninth graders. Seniors Johnathan Brandt and Justin Vaughan are back for the FDSH boys, who will also have senior Dylan Bethke, junior Seth Neumann, sophomores Jonathon and Nathanial Madden, and freshman Eric Crawford on the varsity card for Webster City. The Dodgers are replacing a ubiquitous senior class, led by state qualifier and all-CIML talent Ryan Wagner. Classmates Jason Halverson, Brady Read, Maxwell Hanish and Brennen DeCoursey were also varsity staples before graduating. ”Johnathan and Justin are good senior leaders, as is Dylan,” Jackson said. ”They’re a solid group of kids with a lot of potential. Our lineup will depend strictly on our fastest runners and times; fortunately, we have a (level playing field) among the varsity and junior varsity (when it comes to being on the same course for meets), so we’ll make the necessary adjustments as we go. Jackson mentioned the recent success of both the Iowa Central and St. Edmond cross country programs, as well as the efforts of both Tara and Alex during the summer months in ”creating a short- and long-term future” for his program. ”We really emphasized all of the opportunities cross country has to offer for kids in (the district) who are interested,” Jackson said. ”Tara and Alex are just two of the many examples. To increase numbers, we have to continue to generate excitement. The Fort Dodge Invitational is Oct. 5 this season at Lakeside Golf Course. The district meet is Oct. 19. State cross country will be in Fort Dodge on Oct. 28. Seniors — Justin Vaughan, Johnathan Brandt, Dylan Bethke. Juniors — Jake Bodensteiner, Max Brehm, Collin Ellsbury, Seth Neumann, Noah Rosalez. Sophomores — Jacob Heslop, Michaiah Jones, Daniel Leigh, Jonathon Madden, Nathanial Madden, Logan McIlrath, Gage Riley, Bradyn Wiley, Josh Wunder, Jared Yoder. Freshmen — Chase Anderson, Eric Crawford, Kyle Davis, Carter Delanoit, Caden Elliot, Carter Forbes, Riley Hagen, Grant Harrison, Jason Hobmeier, Austin Jorgensen, Joshua Meier, Brayden Potter. Seniors — Gabby Estlund, Olivia Mitchell. Juniors — Brianna Galvan, Brylea Grady, Christyn Nichols, Shayla Reed, Kayla Smith. Freshmen — Isabel Beekman, Reagan Black, Adyson Bork, Emma Ellsbury, Isabel Gruver, Piera McBride, Hailey Miklo, Bethany Pyland, Alexis Read. Aug. 29 — at Webster City. Sept. 7 — at Marshalltown; 12 — at Storm Lake; 18 — at Humboldt; 21 — at Indianola. Oct. 5 — Fort Dodge Invitational; 12 — CIML Iowa Conference Invitational at Marshalltown; 19 — district meet; 28 — state meet.